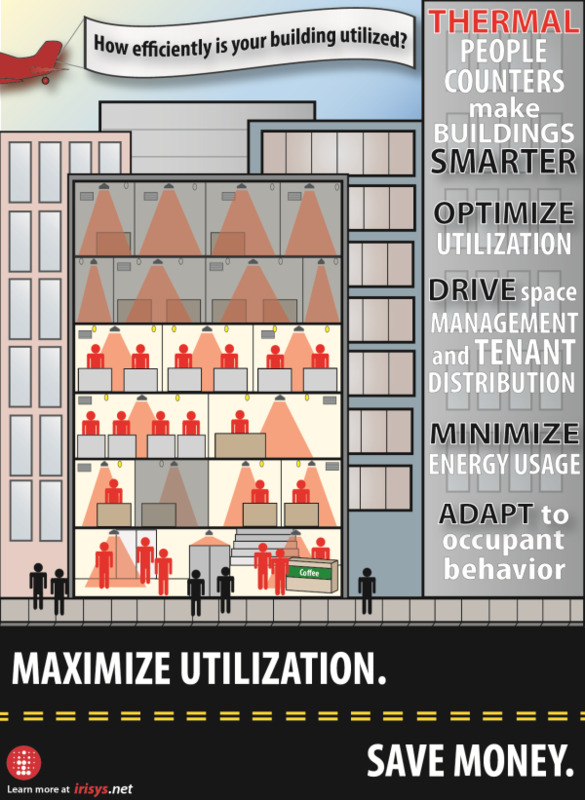 Smart Buildings: Maximize Utilization. Save Money. Thermal technology makes buildings smarter and more efficient. An integrated people counting solution deployed throughout a building increases its intelligence by improving utilization; helping systems constantly evolve to fluctuating occupancies; and lowering overhead costs through reduced energy usage. With building and facilities managers looking for innovative ways to overcome the troubled commercial real estate market, thermal technology has proven to be a strategic part of the innovation that’s making buildings smarter – while saving money. Helping you to make the most of your space and reduce the amount of energy you use, Irisys Smart Building systems deliver living intelligence to help you create efficiencies and a better building environment. Discover how at the Irisys Smart Building blog.